Lightly brown chicken and onion in olive oil in deep skillet. Add in chopped olives, cajun seasoning and undrained diced tomatoes. Simmer on low for 15 minutes while stirring regularly. Add zucchini in with pasta for the last 5 minutes and drain. 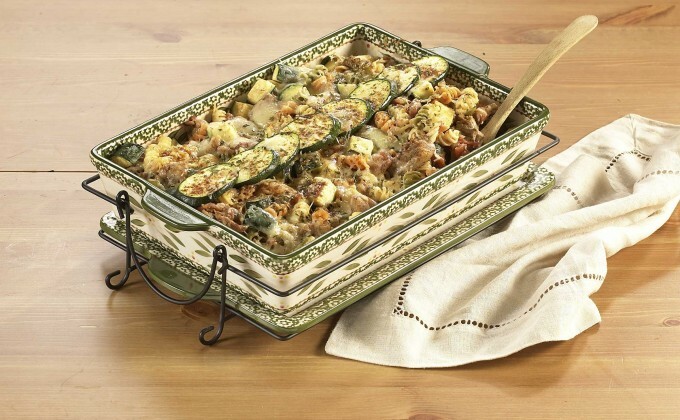 Combine pasta and zucchini with beef mixture and pour into a temp-tations 13x9 baker. Add salt and pepper to taste and sprinkle on cheddar cheese.